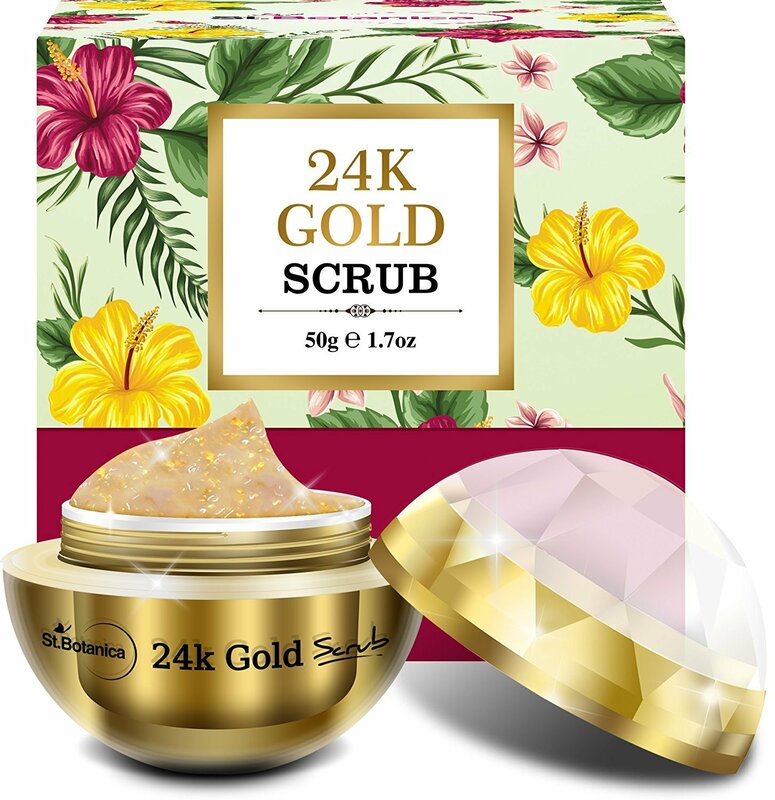 StBotanica Luxurious 24K Gold Scrub intensively repairs and firms skin. It is anti aging and is known to help reduce the appearance of fine lines and wrinkles. We wanted to formulate scrub that goes beyond just exfoliation. The cleansing effect of this unique blend of skin loving nutrients are ideal to combat against blocked pores, blackheads, in-grown hairs and blemishes that will help leave your skin visibly brightened. ; ACHIEVE AMAZINGLY SOFT, SMOOTH, BEAUTIFUL SKIN: Not just a great face scrub but proven skin therapy too - we blend in Aloe Ver, Gotu Kola, Green Tea and skin loving oils of Jojoba & Geranium & Organic Moroccan Argan , that detoxifies, hydrates and moisturizes your skin leaving it ultra soft, smooth and beautiful! ; Radiant Skin - 24k Gold & Vitamin C as one of its main ingredients, it is no wonder your skin will look radiant and bright after few sessions. Antioxidant Vitamin C encourages production of collagen, improves elasticity and protects against damaging environmental aggressors. Exfoliating regularly with the Vitamin C Scrub will also help to optimize the effects of serums and moisturizers in your regime. A must-have to complement your skin care regime. ; Gold is one of the softest metals and is easily absorbed into the skin; thus influencing it at the cellular level. It also helps to reverse the oxidation damage to the collagen fibers, which in turn accelerates the regeneration of healthy new cells. ; The 24K gold imparts an opulent, radiant glow and locks in moisture for ultra-hydrated skin, helps to improve the appearance of fine lines and wrinkles for a youthful-looking complexion. This luxurious 24K gold scrub will leave your skin feeling nourished and hydrated. This facial scrub provides a natural luster and youthful radiance appearance to all skin types.